Cheesecake has long been my dessert infatuation of choice. Having never been a big fan of traditional cake with frosting (I know, right?! ), I started turning to birthday alternatives around the time I was in middle school. I went through an ice cream cake phase, then it was tiramisu and finally, cheesecake. I’ve had some version of cheesecake for my birthday more years than I can count. 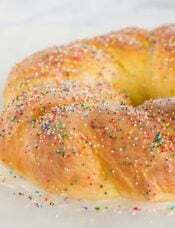 Once I really got the baking bug, I started experimenting with baking my own. The very first birthday “cake” that I made myself was an Oreo Cheesecake, as that was my favorite flavor from The Cheesecake Factory at the time. I don’t make many cheesecake bars (instead opting for a cheesecake the size of my head), but after playing around with some cheesecake bars this summer, I decided I needed to make more of them. An Oreo version was the next logical step. These cheesecake bars have a thick, substantial crust, which I love. 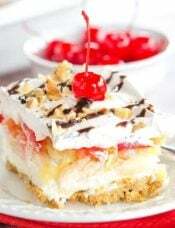 Nothing is worse than cheesecake or cheesecake bars that sit upon a wimpy, thin, soggy crust. Thick and sturdy is the only way to go, and this crust fits the bill. 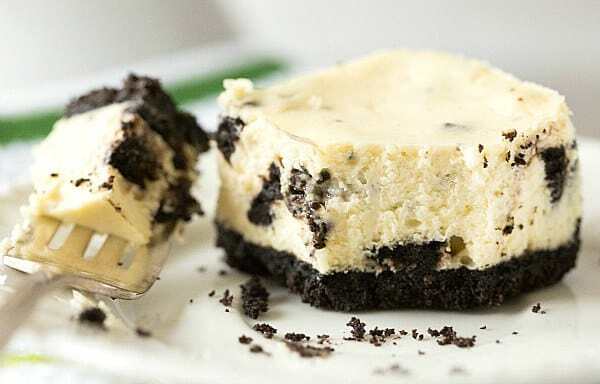 On top is a smooth, creamy cheesecake that is absolutely packed with chopped Oreo cookies. One of the things I love about cheesecake bars is that I don’t feel nearly as guilty about eating two as I do when I eat two pieces of cheesecake (not that that’s ever stopped me!). I haven’t used them in this recipe yet, but if you wanted to go the 100% from-scratch route, you could even use homemade Oreos! That cuts down on the guilt factor even more ;-) If you give them a try in the recipe, I’d love to hear how it goes! 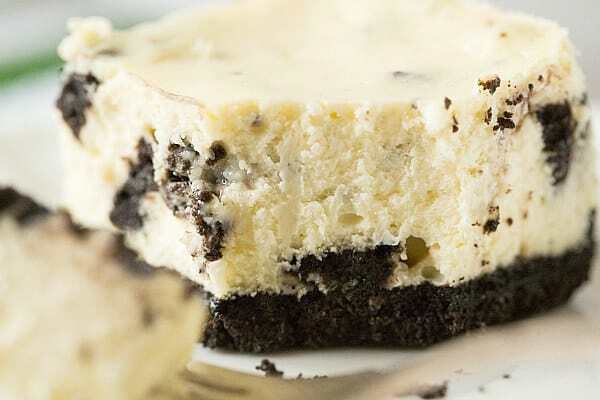 A bar version of the fabulous Oreo Cheesecake, complete with an Oreo crumb crust and a creamy cheesecake loaded with chopped Oreo cookies! Preheat oven to 325 degrees F. Line an 8x8-inch square baking pan with foil or parchment paper, allowing it to hang over two of the sides. Make the Crust: Process the Oreo cookies in a food processor until they are turned into fine crumbs. 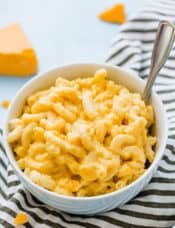 Drizzle the melted butter over top and pulse a handful of times until the butter is evenly distributed and all of the crumbs are moist. 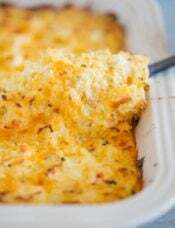 Dump the crumbs into the prepared baking dish and press into an even layer. Bake for 10 minutes (leave the oven on). 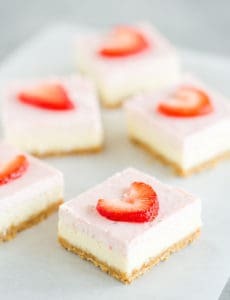 Make the Cheesecake: Beat the cream cheese on medium-high speed until smooth, about 2 minutes. Gradually add the sugar and beat until incorporated. Slowly add the eggs, beating well after each addition, and mix until completely combined. Scrape down the sides of the bowl and add the sour cream and vanilla, beating until incorporated. 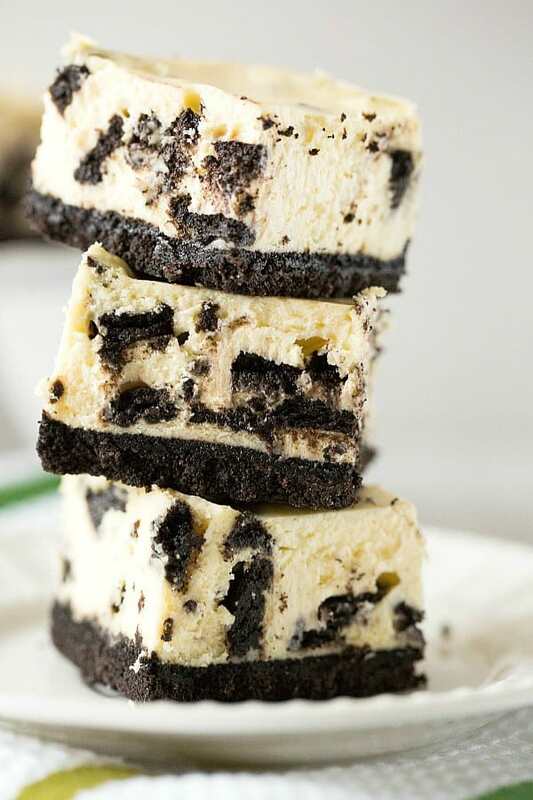 Gently fold in the chopped Oreos, then pour the batter over the prepared crust, smoothing it into an even layer. Bake until the edges are set but the middle still jiggles slightly, about 40 to 50 minutes. Place the pan on a cooling rack and let cool to room temperature, about 2 hours, then cover the pan with plastic wrap and place in the refrigerator for at least 3 hours (or up to 24 hours) before serving. To serve, lift the cheesecake out of the pan using the parchment or foil handles. Slice into bars and serve. Store leftovers in an airtight container in the refrigerator for up to 1 week. Should I multiply the ingredients by 1.5 for a 9×13 pan? Hi Nicole, Yes that should work perfectly! Hi! 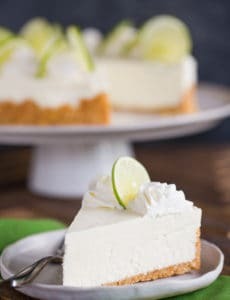 I’m baking the cheesecake right now, and I was wondering… Can I put it in the freezer so it will cool faster, or will that ruin the consistency? Hi Kelsi, Definitely do not put it in the freezer. It’s important for cheesecake to cool at room temperature, as it continues to cook and set up inside. Hi, I baked these as directed and even left them in for an extra 7 minutes, and they are still like firm pudding in the middle. What did I do wrong? 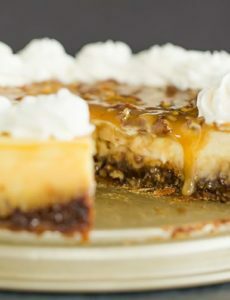 The sour cream in this recipe helps to keep the bars moist, I would not omit it. Hi I wanted to make these in a 9×13 pan because I will be feeding 14 people and I want the size of the piece to be substantial. So I was planning on doubling the recipe, does that mean that everything gets doubled even the amount of cookies used in the crust and batter? Also shouldn’t the oven temperature stay fairly the same because the amount of surface area also increases 2 times. I meant to say wouldn’t the amount of minutes it would be in the oven stay the same. 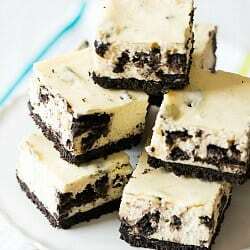 I plan on making these on Friday so if you could get back to me as soon as you can I would really appreciate that. Hi Erika, Yes, you should double all of the ingredients. The oven temperature should remain the same, but you may need to make them for a few minutes longer. Thanks Michelle, turns out my mom will also make an apple pie for our gathering so I will just end up sticking completely to your recipe, but thank you for responding so quickly. 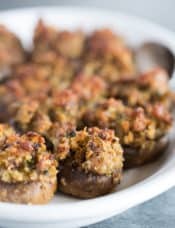 EXCELLENT recipe, everyone loved it at the birthday party I made it for! 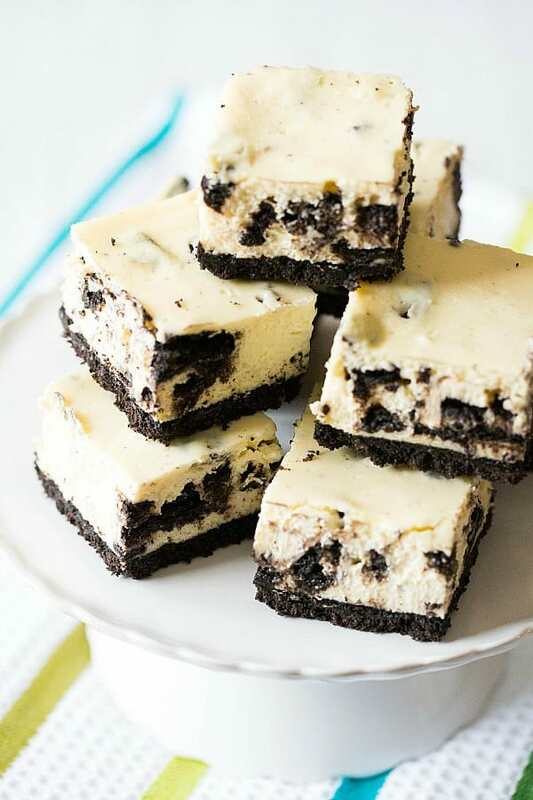 I just made these Oreo cheesecake bars! 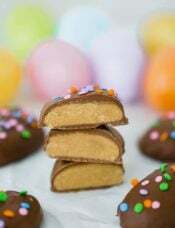 Easy to make and I baked them in a glass (Pyrex) type pan, 9×9″ without parchment paper. They turned out fine, but don’t overbake! I found the chocolate/Oreo flavor in these bars didn’t “pop” so I glazed the top with a rich chocolate glaze. Perfect! I used whole cream cheese, too, not low fat. Good, rich dessert! How does an 8×8 make 16 squares ? Are they pretty small? Danielle, They are 2-inch squares. These are pretty rich, so I think it’s a good size, but you can of course cut them larger if you wish.